Mike Pence would like you to know that Mike Pence is not involved in any of this. At least that appears to be the message coming from Pence’s allies, and perhaps the vice president himself, as the Trump White House reels from a series of interlocking scandals that threaten all manner of political peril, even potentially an impeachment or resignation that could make Pence the president of the United States. All of a sudden we’re seeing a wave of articles in which anonymous sources close to Pence tell reporters that he’s completely out of the loop, to use the phrase that then-Vice President George H.W. Bush uttered so memorably when claiming his innocence in the Iran-Contra scandal. But can we believe it? Nobody tells him anything! How can he possibly have any culpability for administration wrongdoing when he’s barely involved in any of this running-the-government stuff? Sources close to Pence would also like you to know that “Pence was not consulted about the decision to bring on Flynn as the national security adviser in November.” I barely know the guy, I tell ya. You’ll recall that Flynn was supposedly fired because he told Pence that he didn’t discuss the potential easing of sanctions with Russian ambassador Sergey Kislyak when he and the ambassador talked multiple times during the campaign, a lie that Pence then repeated to the press. This affront to Pence’s honor was so profound that President Trump had no choice but to give Flynn the boot. Flynn was paid half a million dollars to lobby on behalf of Turkey while he was advising the Trump campaign, and in January, on the advice of his lawyer, he retroactively registered as the agent of a foreign government. Though Flynn informed the Trump transition’s legal team of this fact, Pence says that no one told him, despite the fact that he was in charge of the transition. Pence claimed in March to have just found out about Flynn’s work for Turkey. Yet Rep. Elijah Cummings (Md. ), the ranking Democrat on the House Oversight Committee, sent Pence a letter on Nov. 18 going into considerable detail about Flynn’s Turkey connection. As of yesterday, Pence was standing by his assertion that he only learned about it in March. As leader of the transition, it was Pence’s job to make sure that things such as appointing a national security adviser with troubling ties to foreign governments didn’t happen. So his defense in the Flynn matter comes down to: I was doing a terrible job leading the transition and had no idea what was going on. That then brings us to the matter of FBI Director James B. Comey’s firing. . . . . We quickly learned, however, that Trump intended to fire Comey all along. Trump said so in an interview with NBC, and Rosenstein confirmed it to senators yesterday when he told them that he was instructed to write the memo after being told that Comey would be fired. So the initial White House line was a lie, which was only corrected once Trump blurted out the truth. Did Pence know? 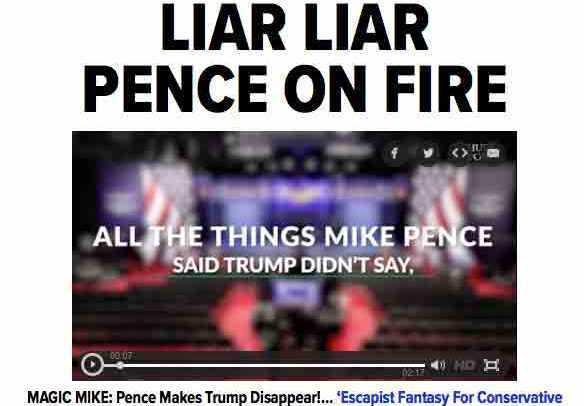 . . . . if you parse Pence’s words carefully enough, you can come up with an interpretation in which he was being technically accurate despite giving an intentionally misleading impression. Anyone who has gone to work in this administration risks being tainted with its excesses, its incompetence and its corruption. No one is more at risk than Pence, who plainly harbors presidential ambitions of his own — and might even become president without having to run for the job. So the steady narrative coming from Pence associates — that he has nothing to do with the parade of horrors issuing from the administration — could be an attempt to inoculate him for some later date when he has to stand before the voters on his own. Sure, I was there, he may say, but I really wasn’t involved with that catastrophe. If Pence thinks that argument is going to fly, he’s got another thing coming.